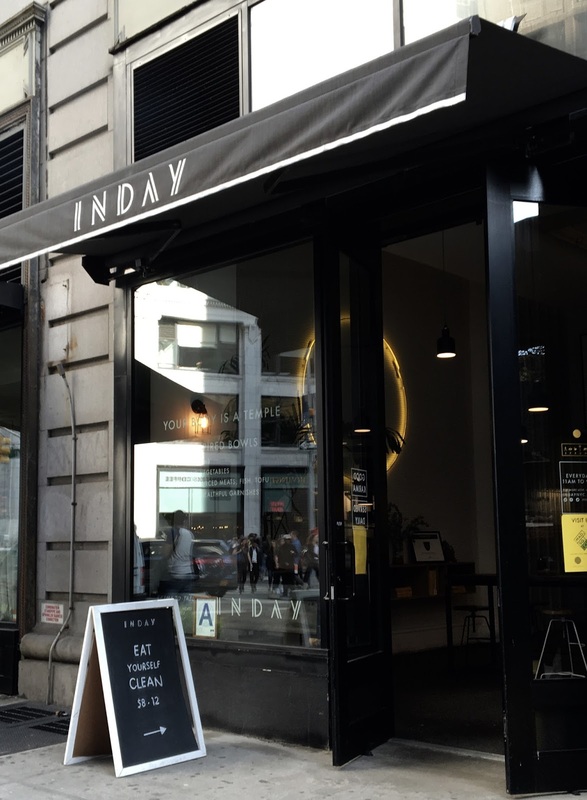 What's cool about Inday is that the whole spread is gluten-free, vegan friendly, and made from scratch. The restaurant is Chipotle-style in the sense that you design your bowl from the bottom up, customizing to your tastes. 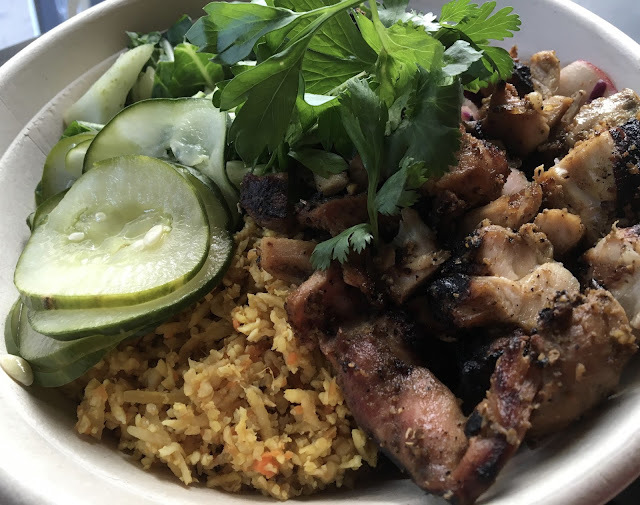 Pre-made suggestions are provided on the menu, but everything is customized to your tastes so feel free to be picky and let the staff know what you want in or out of your bowl. 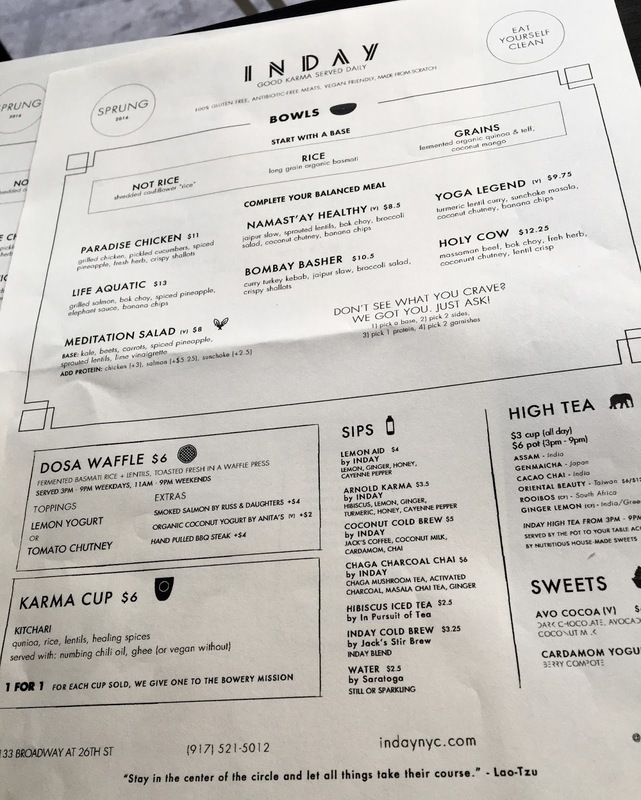 Other menu options include a dosa waffle, karma cup, assorted beverages and a variety of dessert options. The only dairy-containing items are the yogurt sauce and ghee (for the karma cup, but it can be made vegan). For my bowl, I ordered the riced cauliflower as a base. This is all the rage in grain-free paleo circles, and I wanted to try it for myself. I debated between the chicken and the turkey but because the latter was out, I chose the chicken by default. As vegetable toppings I chose bok choy, pickled cucumbers, herbs, and vegetable slaw (hidden in this picture). The chicken was delicious, chargrilled and spicy without being too heated. The other vegetable toppings were fresh and flavorful, with my favorite being the vegetable slaw which was an unexpected surprise as I typically am not much of a slaw fan. The cauliflower was an interesting culinary experience though, and I think the verdict is still out as to if I am a fan. Texturally it is a bit mushier than rice, and being a vegetable, it's grain-free and filling. As a newbie, I liked the novelty of the "not rice" but I probably would opt for rice next time out of familiarity. Because I knew I wanted to eat around the menu a bit, I also ordered a dosa waffle, which is made with a fermented basmati rice and lentil batter. The waffles and irons are dedicated gluten-free and vegan, and can be dressed up with chutneys and other toppings. I chose the tomato chutney. The waffle itself was excellent, crispy, airy, and light. It was slathered with spicy tomato chutney, which added a savory flavor and sprinkled with fresh herbs. It definitely would not hold me over as a full meal but it was perfect to split with my mom in addition to our bowls. Waffles are such a rare treat for gluten-free, dairy-free eaters, and this untraditional presentation of the breakfast fare impressed me. Some of Inday's beverage options are below. They are made in-house and are crafted to be health-promoting. The vegan, gluten-free dessert option is avo cocoa pudding, which is dark chocolate pudding. I did not try it on my visit, but hoped to grab it for a snack later in the trip (I unfortunately did not). Inday successfully merges the familiarity of design-your-own bowls with the exotic flavors of India. While this cuisine is different than than more traditional Indian restaurants I have been to I liked the modern flavors and focus on nourishing, real food. Just a block from my hotel, it was a perfect discovery and is a bit off the radar of more overt dedicated gluten-free restaurants. I left feeling rejuvenated and full, ready to see where my NYC night would take me. Update 3/31/17: In a second visit, I decided to try a different combination of ingredients. I selected the grain bower bowl, which has an ancient grains base and comes with tangy brussels sprouts, spicy chickpeas, potent pickled onions, crunchy radishes, lentil crisps. For my protein, I opted for the turkey meatballs, which came with a green chili sauce. The whole bowl was hearty and delicious, with flavors that dance around each other. The highlights of the bowl for me were the tender, juicy meatballs, crunchy lentil crisps, and the spicy brussels sprouts. As a beverage I selected the hibiscus tea, which is unsweetened but has an intense hibiscus concentration for flavor. The food was just as excellent as my first visit, and I will definitely return on a future New York City visit!